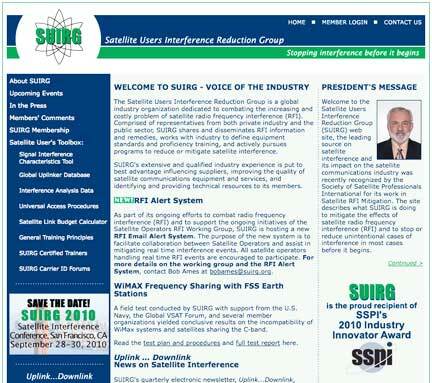 [SatNews] The Satellite Users Interference Reduction Group (SUIRG) has launched an important new tool in its continuing quest to identify and mitigate the ever-growing problem of satellite interference. SUIRG’s Signature Interference Characteristics tool (SIC) provides assistance to the satellite community when encountering and resolving unknown signals that cause interference with their satellite service. Many radio interference signals have unique spectrum signatures; SUIRG has identified and catalogued over two dozen types of the most common forms of interference. The SIC provides spectrum examples based on this interference catalogue, along with possible causes and suggested corrective measures that can be taken to solve the actual interference incident. The online SIC tool is constructed like a picture book, with sample plots depicting various types of satellite radio interference. The tool allows a user to select the interference signature most closely corresponding to what he or she is experiencing or to scroll through the plots until they locate one that closely resembles their on-going interference problem. By clicking on the selected SIC plot, the user connects to a new window that provides a detailed description of the interference type, along with possible sources and suggested corrective measures. According to Robert Ames, SUIRG President and CEO, “the tool is a continuous work in progress; the more examples we can build into the database the more effective and valuable it will become to the satellite industry at large. We encourage operators to submit examples of interference cases and their accompanying spectrum plots for consideration to be included with the current SIC tool scenarios.” Interference examples and plots can be submitted via the Signature Interference Characteristics tool home page at www.suirg.org.